Salmon is an excellent source of vitamin B12, vitamin D, and selenium. All varieties of salmon contain a significant source of protein and omega-3 fatty acids, particularly EPA and DHA. Salmon’s robust flavor and dense nutrient content has increased its popularity amongst seafood options. Not only does salmon contain substantial levels of protein and essential nutrients, but it also has significant prophylactic benefits. Salmon has been shown to decrease one’s risk for dementia, cognitive decline, heart disease, and even cancer. There are six types of salmon distributed in the United States. These include Atlantic, Chum, Chinook, Coho, Pink, and Sockeye Salmon. All of these varieties, with the exception of Atlantic, are harvested from wild fisheries. Atlantic salmon is predominantly farm raised. To understand more about salmon nutrition, all varieties of salmon contain a significant source of protein and omega-3 fatty acids, particularly EPA and DHA. DHA is critical for pre-and post-natal brain development, whereas EPA appears more significant for behavior and mood. Fat content ranges from approximately 4-11 grams, per 3 ounce serving. Omega-3 fatty acid content is varied, usually between 700 and 1,800 milligrams, per 3 ounce serving (Source: USDA National Nutrient Database for Standard Reference). Canned salmon with bones is a good source of calcium, as seen in the nutrition facts. The American Heart Association recommends that adults consume fatty fish at least two times per week. Individuals suffering from cardiovascular disease should eat 1 g of EPA and DHA combined per day, the omega-3 fatty acids found in salmon. Research has shown that eating a diet rich in fish oils can aid in preventing heart-related complications. A study conducted at Harvard School of Public Health in 2002 suggested that higher fish and omega-3 fatty acid intake is correlated with a lower risk of cardiovascular disease; principally, cardiovascular disease related deaths. In a 2007 evaluation of several controlled trials, it was determined at the University of California, Berkeley that a combination of DHA and EPA has shown to benefit AD/HD (attention deficit/hyperactivity disorder), autism, dyslexia, dyspraxia, and aggression. A meta-analysis confirmed that DHA and EPA combined showed benefits in bipolar disorder and major depressive disorder, as well as encouraging results in schizophrenia. This evaluation indicates that the combination of EPA and DHA omega-3 fatty acids are essential for proper cognitive abilities and improvement in various mental illnesses. Evidence has suggested that fatty fish, such as salmon, can benefit the elderly. A Tufts University study in 2005 demonstrated a correlation between the consumption of fatty fish and a reduction in risk of dementia by 28% and Alzheimer’s disease by 41%. The decrease in risk for cognitive decline is significant and indicates the necessity for aging adults to consume enough fatty fish in their diet. And as if there were not enough benefits from salmon, it also contributes to a reduced cancer risk. In 2009, the National Cancer Center in South Korea found that a high consumption of fatty fish, like salmon, was linked to a reduced risk of breast cancer in women. Men may benefit from a reduced cancer risk, as well. The Karolinska Institute in Stockholm, Sweden discovered in 2007 that fatty fish intake might reduce the risk of prostate cancer in men. Nonetheless, despite these excellent preventative properties, farmed salmon contains high concentrations of compounds, such as PCBs, dioxins, and chlorinated pesticides, all of which are contaminants. The presence of these contaminants reduces the overall health benefits of salmon. European raised salmon has much greater contamination than those raised in North and South America. Thus, while choosing farm-raised salmon, paying attention to the location it has been imported from may be useful. When planning your next nutrient-dense meal, aim to incorporate fatty fishes, like wild salmon, into your diet. The excellent preventative health benefits of salmon should be enough to convince you that it is more than just a source of protein and nutrients. There is an assortment of life-threatening diseases that salmon's health benefits can help keep at bay. Hu FB, Bronner L, Willett WC, Stampfer MJ, Rexrode KM, Albert CM, Hunter D, Manson JE. Fish and Omega-3 Fatty Acid Intake and Risk of Coronary Heart Disease in Women. The Journal of the American Medical Association. 2002; 287(14):1815-1821. Kidd PM. Omega-3 DHA and EPA for cognition, behavior, and mood: clinical findings and structural-functional synergies with cell membrane phospholipids. Alternative Medicine Review. 2007; 12(3):207-227. Huang TL, Zandi PP, Tucker KL, Fitzpatrick AL, Kuller LH, Fried LP, Burke GL, Carlson MC. 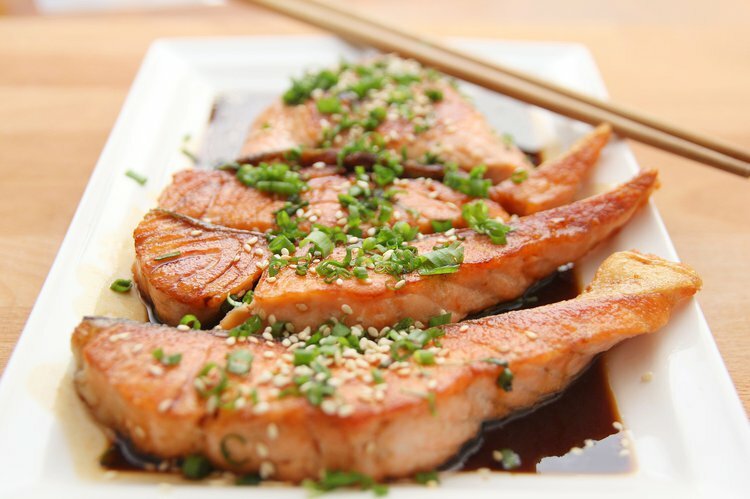 Benefits of fatty fish on dementia risk are stronger for those without APOE epsilon4. Neurology. 2005; 65(9):1409-1414. Kim J, Lim SY, Shin A, Sung MK, Ro J, Kang HS, Lee KS, Kim SW, Lee ES. Fatty fish and fish omega-3 fatty acid intake decrease the breast cancer risk: a case-control study. BMC Cancer. 2009; 9:216. Hedelin M, Chang ET, Wiklund F, Bellocco R, Klint A, Adolfsson J, Shahedi K, Xu J, Adami HO, Gronberg H, Balter KA. Association of frequent consumption of fatty fish with prostate cancer risk is modified by COX-2 polymorphism. Int J Cancer. 2007; 120(2):398-405. Ramel, A., Martinez, J. A., Kiely, M., Bandarra, N. M., & Thorsdottir, I. (2010). Moderate consumption of fatty fish reduces diastolic blood pressure in overweight and obese European young adults during energy restriction.Nutrition, 26(2), 168-174. Foran, J. A., Good, D. H., Carpenter, D. O., Hamilton, M. C., Knuth, B. A., & Schwager, S. J. (2005). Quantitative analysis of the benefits and risks of consuming farmed and wild salmon. The Journal of nutrition, 135(11), 2639-2643. Lara, J. J., Economou, M., Wallace, A. M., Rumley, A., Lowe, G., Slater, C., ... & Lean, M. E. (2007). Benefits of salmon eating on traditional and novel vascular risk factors in young, non-obese healthy subjects. Atherosclerosis,193(1), 213-221. Urwin, H. J., Miles, E. A., Noakes, P. S., Kremmyda, L. S., Vlachava, M., Diaper, N. D., ... & Yaqoob, P. (2012). Salmon consumption during pregnancy alters fatty acid composition and secretory IgA concentration in human breast milk. The Journal of nutrition, 142(8), 1603-1610.